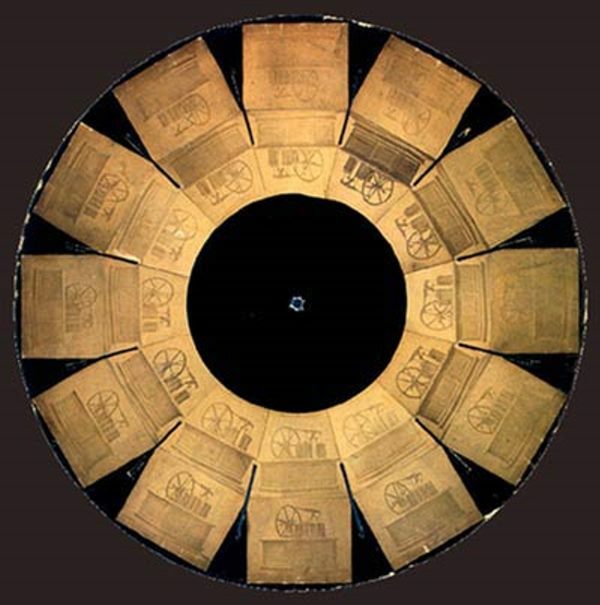 Jules Duboscq, bioscope disc, c. 1852. Coll. Joseph Plateau, Musée de l'Histoire des Sciences, University of Ghent, Belgium, catalogue no. MW96/1859. Muybridge's stereographic movie experience can't now be reconstructed, however. Fragments of stereoscopic glass plate negatives for what appears to be this series were unearthed from a garden behind Muybridge's house in Kingston-on-Thames in 1998. [Zone] One of these damaged stereoscopic negatives is illustrated in Herbert, ed. This source confirms that most of the fragments found in 1998 are in very poor condition, and in many cases the image has disappeared. That said, the holographer David Pizzanelli has, in recent years, successfully created holograms using re-photographed images from Muybridge's Animal Locomotion. By employing 'temporal parallax', rather than stereographic parallax, he has produced moving holograms from the original sequence photographs. See Pizzanelli's website for more on this, with 2D examples. Quicktime movies of Pizzannelli's holograms may also be found here. It's not known whether or not Duboscq's bioscope disc was ever presented publicly. William Friese-Greene (1855–1921) claimed to have made an experiment in stereoscopic cinematography in October 1889, using a camera built by Frederick Henry Varley, and filming in Hyde Park, London. Varley patented the camera on 26 March 1890. Evidence for successful projection, however, is widely disputed, and the date claimed is unlikely, as the surviving celluloid appears to have been of Eastman manufacture, not available in England before early 1890 [Spehr, pp110-1]. W.E.L. Day's account, in the (old) Dictionary of National Biography reports that public exhibition was made at Chester Town Hall in July 1890, and that a portion of this film was (1927) in the Science Museum in London; however this account does not describe the film as stereoscopic. A very rare fragile fragment of the first stereoscopic film made by Friese-Greene and Varley around 1890 can be found in the Will Day collection of the Cinémathèque Française: it is 15.5 cm x 45.5 cm and consists of two rows of six successive images of a man walking down a street, seen from behind. It is a poetic and rather strange sight, as though this elegant top-hatted gentleman judged the problem to have been definitively solved and so was leaving the scene, with an enigmatic and slightly contemptuous air. Will Day is the W.E.L. Day of the DNB article. His collection at the Cinémathèque Française was purchased from the Science Museum, so it seems reasonable to surmise that both accounts refer to the same film. [Silent Era website, Who's Who of Victorian Cinema]. Three successive images from stereoscopic film shot by Friese-Greene in Varley's 1890 camera are reproduced at p46 of Coe. Coe notes that in this example the camera was operating at less than one frame per second. So it was not really a movie at all, by the standard adopted here. Around September 1899 William Kennedy-Laurie Dickson patented a method for taking and viewing stereoscopic moving images. A working model was developed, and an experimental stereo image appears in Spehr, p. 610. The chronophotographer Lucien Bull (1876–1972) was filming high-speed (500 frames per second) stereoscopic photography of insect flight as early as 1902, using two strips of film on a rotating drum. Stereo footage from 1904, of a dragonfly in slow motion, may be viewed on the Origins of Scientific Cinematography DVD. Raoul Grimoin-Sanson (1860–1940) began experimenting with movie cameras and projectors in 1895, and was in contact with other early researchers such as Étienne-Jules Marey. He patented the Cinéorama on 27 November 1897. The earliest 360° cylindrical panoramic movie, Cinéorama was an early film experiment and amusement ride at the 1900 Paris Exposition, that simulated a ride in a hot air balloon over Paris. It represented a union of the earlier technology of panoramic paintings and the recently invented technology of cinema. Cinéorama consisted of ten synchronized 70mm movie projectors, projecting onto ten 9 x 9 metre screens arranged in a full 360° circle around the viewing platform. The platform was a large balloon basket, capable of holding 200 viewers, with rigging, ballast, and the lower part of a huge gas bag. The earliest-known surviving anaglyphic film is Kelley’s Plasticon Pictures: Movies of the Future and Thru’ the Trees: Washington, DC, made in 1922/3 by William Van Doren Kelley (1876–1934), and photographed by William T. Crespinel (1890–1987). Originally anaglyphic (r/b), the film has been fully restored and was shown again in 2006, for the first time since the 1920s, in a new polarized dual-35mm print. It is now also available on the 3-D Rarities 3D Blu-Ray. [3D Moving Pictures; 3-D Rarities booklet] NB Cherchi Usai states that Crespinel's anaglyphic [Stereoscopic Film Test], dating from Winter 1919, is the earliest 3D film known to survive; it is apparently held at George Eastman House. Cinerama: Cinerama is the trademarked name for a widescreen process that works by simultaneously projecting images from three synchronized 35 mm projectors onto a huge, deeply-curved screen, subtending 146° of arc. The original system involved shooting with three synchronized cameras sharing a single shutter. The display is accompanied by a high-quality, seven-track discrete directional surround sound system. Invented by Fred Waller (1886–1954), it was a development of earlier systems he had created, starting in 1937/8 with a rig on which were mounted eleven 16 mm cameras driven by a single motor, with which he filmed from his car driving down a road in Huntington, New York; the first successful screening of this film used only four projectors and a 6' radius spherical screen, and it took a further nine months before he succeeded in synchronising all eleven projectors. In November 1938 Waller and others formed the Vitarama Corporation, to develop the process. [Waller: Cinerama] A clip showing a few seconds of four Vitarama test panels from 1938 appears in the documentary Cinerama Adventure, which is included on the Blu-ray of How the West Was Won. The system was further streamlined for a very specific purpose, the 'Waller Flexible Gunnery Trainer', first built after the attack on Pearl Harbor in 1941, which involved five synchronised film projectors and a screen constructed as a section of a hollow sphere of 20' radius, 150° in width, 75° in height. [Waller: Gunnery] After the war (November 1946) the Cinerama Corporation was formed, and in due course the most significant Cinerama process was developed, as described above. The first film both shot and projected in IMAX Dome (formerly OMNIMAX) was Garden Isle, directed by Roger Tilton, released in August 1973, and premiering at the Reuben H. Fleet Space Theater and Science Center, San Diego, California. IMAX Dome is more immersive than standard IMAX, wrapping 180° horizontally, 100° above the horizon and 22° below the horizon for a viewer at the centre of the dome. Interactive movie mapping: The Aspen Moviemap began as an idea by Massachusetts Institute of Technology undergraduate Peter Clay, in collaboration with graduate students Bob Mohl and Michael Naimark. Clay 'moviemapped' the hallways of MIT in early 1978, as the second demonstration videodisc made by the Architecture Machine Group. The Aspen Moviemap is now viewed as a classic of hypermedia; the contemporary Google Street View—a feature of Google Maps and Google Earth—builds on the same concept. Google Street View, launched on 25 May 2007, provides 360° horizontal and 290° vertical panoramic street level views and allows users to view parts of some regions of the world at ground level. Since 1 April 2010 Google Street View has also been available in anaglyphic 3D. Interactive stereoscopic panorama: Naimark also developed, in 1994, an installation called 'Be Now Here (Welcome to the Neighborhood).' Just as the Banff Kinetoscope was an experiment in making a stereoscopic version of interactively moving around, 'Be Now Here' was to complement it by making a stereoscopic version of interactively looking around. The concept was to assemble an experimental camera system to film stereoscopic panoramas, then to go to public gathering places, and film throughout the course of a day from a single position. The experience would be analogous to standing in a single place, with both eyes open, and being able to look around but not move from the spot. The Getaway is a free-roaming, mission-based, 3D action game set in London. The Getaway features nearly 40 square kilometers of photo-realistically recreated London blocks and street corners, creating the most technological and realistic reenactment ever seen in a videogame. Spherical VR panoramic movies: Spherical VR panoramic movies are now feasible, as can be seen at Redbull Surfing. This uses the Dodeca 2360 Camera System, launched in 2004—a camera system that takes in high-res video streams (at 2400 x 1200 pixels per frame, 30 frames per second), and captures the GPS coordinates of its motion. The camera can record for up to 3 hours at a time. [Wired blog network] Immersive Media Company, which makes the Dodeca System, was founded in 1994, and the world’s first full motion, fully immersive video movie was debuted at the 1995 SIGGRAPH convention in Los Angeles, California. The movie featured a basketball game where the camera was placed on a tripod on the court. At CES 2017, Intel announced a partnership with Hype VR to deliver high-fidelity video capture that allows viewers to move around a video scene as if they were there. A recording of the demonstration is here. At TechFest in February 2009 Microsoft first unveiled a new technology then known informally as Videosynth. Developed by Ayman Kaheel and a team at the company's Innovation Centre in Cairo, this extended the Photosynth concept into the time dimension by means of stitching video footage captured on multiple mobile phones into a higher-resolution 3D panorama, synchronising them from the phones' timecodes. Videosynth featured in CSI: Miami Season 8 Episode 12, 'Show Stopper'. By December 2009 the emphasis had shifted to stitching videos live, in real time, and the product renamed Mobicast; a demonstration video is here. Etienne-Jules Marey (1830–1904), as an aspect of his experimentation into the mechanism of the wing in relation to air movements and air pressure, made in 1887 a number of photographs of gulls and pigeons in flight, viewed simultaneously from three directions—above, parallel, and perpendicular to the axis of its flight—after which he sculpted plaster models of the birds, each depicting a single phase of the wing as it moved through one complete cycle. He then mounted these sculptures in a very large zoetrope, creating what he called 'synthesis in relief'. As the zoetrope was spun, he could view the bird's flight, both in real time and in slow motion. Braun includes a photograph of the 3D zoetrope and the mounted pigeon sculpture (p141). This process, like photosculpture, is a photography/sculpture hybrid. Virgilio Tosi (2005) Cinema before Cinema. The Origins of Scientific Cinematography, 2nd edn. London: British Universities Film and Video Council. This page was last revised on 2019-02-22.